Monday Update on Current Weather Page...BB6 moves Northwards into Pakistan..see Current weather Page for Latest @ 10.30am..
and GSB's Latest analysis on Inter Active Page.. This note is not a forecast nor a quantum estimate. It is just how to begin a Monsoon Watch for the NEM. In the very initail para, we begin with the basic fact of the Monsoon origins. SWM has its origin around the Mascarene Highs off Madagascar, and the NEM has its origin round a large anticyclone over Siberia. However, coming to the advances of these systems, the mode of setting of the 2 monsoons differ. The onset of SWM is well defined, and follows progressively Northwards.This can be monitored quite accurately on weather charts. On the other hand the onset of the NEM is not clearly defined. In fact, in some years, there has been no clear indication between the withdrawal of the SWM in peninsula India and the onset of the NEM. I would, on the above point, normally hesitate to actually present or believe a "normal date" for the onset of the NEM in the Southern States. Another point of comparison between the 2 monsoons is that, the NEM, during its life cycle, is normally with interrupted rainfall. The rainfall occurs in spells, accompanied by storng surge of cold air from the Siberain "origin". Many a times, these surges are associated with the formation of lows and systems in the Equatorial South China Seas. These systems move westwards. Occasionally, these systems intensify. SWM generally has an un-interrupted rainfall in its four months tenure in some regions or the other. Now, the commencement of the NEM , as stated above, is directly corelated to the withdrawal of the SWM. Hence, to start monitoring and "watching" the NEM, we must follow the withdarawl. Factors are to be considered while studying or monitoring the SWM withdrawal and NEM commencement. 1. An anticyclone starts forming at sea level and 850 hpa level initially in Sindh and spreading to NW India. Originally, the seasonal low forms in May as a result of thermal highs, that is high temperatures. Now, we should observe and record the rate of (night) temperature drop, to see the diminishing of the low. A prelude to monsoon withdrawal. 2. The Monsoon axis starts moving Southwards, and for the NEM, rotates the wind directions. Both points, 1. and 2. are related and occur when the axis movement starts towards the South. For this, we have to monitor the wind change direction and dissolving of the "supporting" low in Sindh (Pakistan). 3. 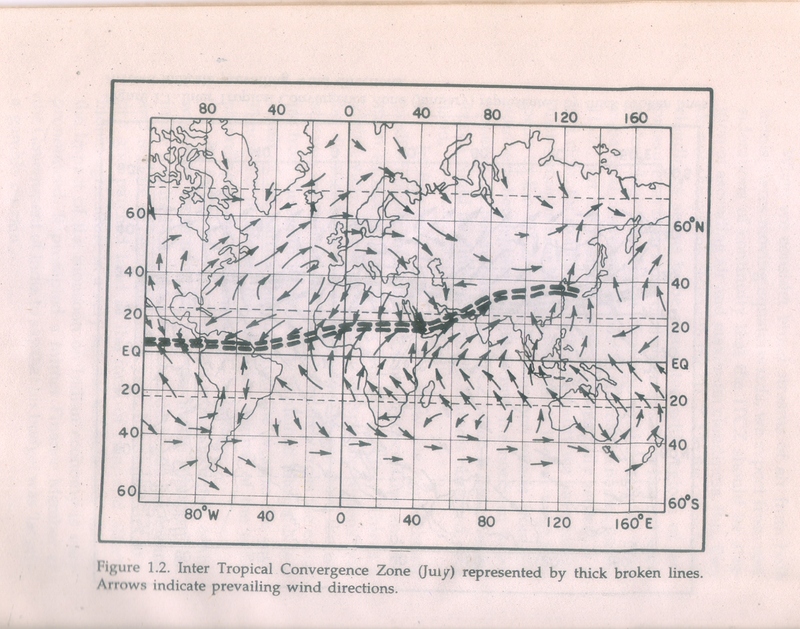 The ITCZ, simultaneously starts shifting Southwards. 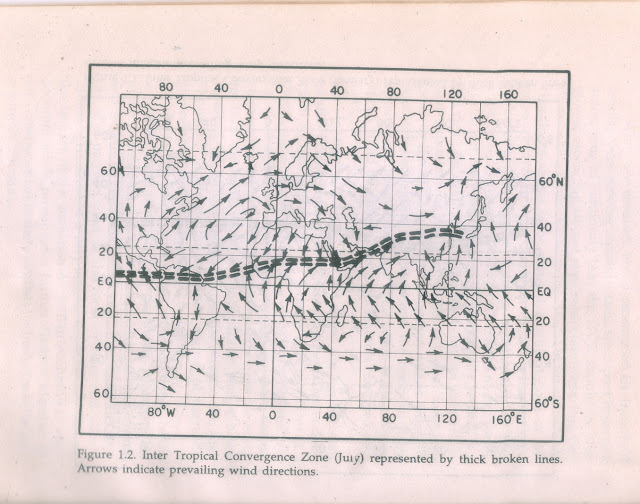 See Position of ITCZ in SWM(Diagram shows extreme break Monsoon Position) and in NEM (Winter). 4. An anticyclone moves towards central India at the 200 hpa level. 5. Extreme High pressure initial formation starts in Lower Siberia regions. Now, like the Mascrene Highs are the "power House" of the SWM. the Siberian/Tibetan high is the "power house" of the NEM. 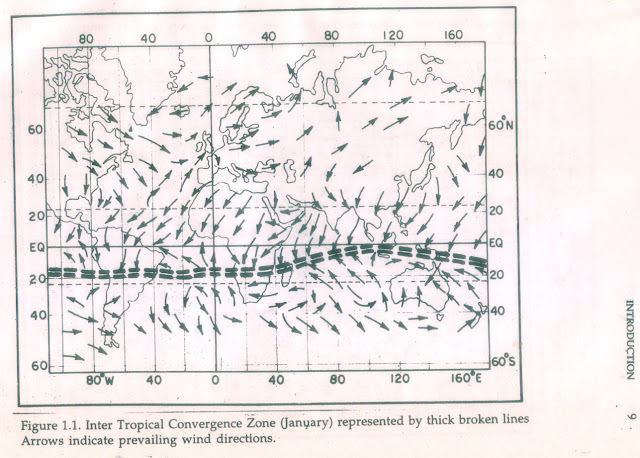 Force winds rush from these highs towards the Bay and south China Seas in 2 seperate branches (Hadley Cell). Cooling of the region results in a good High formation. 6. Upper air stability visible observations to be seen. Cloud formations and clear (moisturless) skies are a strong indicator of the lack of monsoon atmosphere. For this actual observations and on-the-spot reports help. 7. The SW cross equatorial winds weaken. 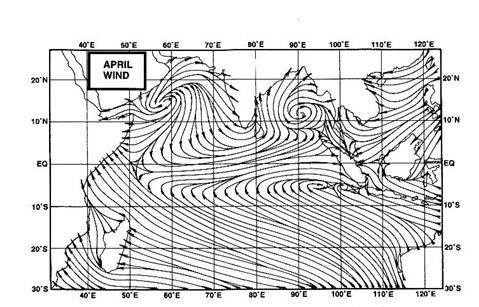 Normally in a full SWM season, the depth of the SW winds coming into India. The reversal of wind fields occur at 6 kms. 1.The Upper winds during the NEM across the Bay are in a clockwise direction. That is an anti-cyclone is formed. At a level of 500 mb, the centre of the anticyclone shifts to central Burma region.Another factor are the jet streams. In the SWM, the Tropical Easterly Jet stream dominates the Peninsula, while the Sub-tropical Westerly Jet Stream is the feature of the NEM. 2.The normal Sea Level Pressure during the NEM is a large system of low pressure over the Central Bay. It can extend into the Indian Peninsula as a trough.Towards the end of November, there is a shift southwards of this extended low. 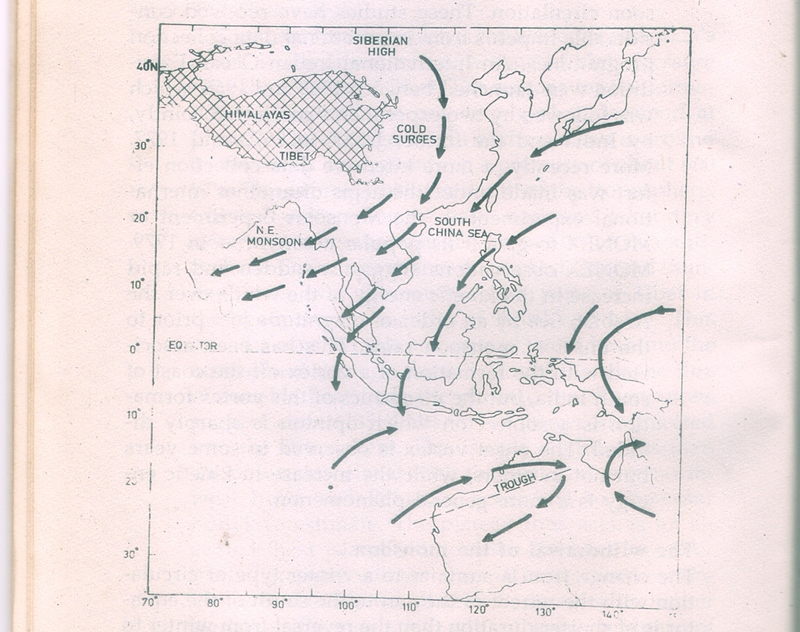 3.The general variations and fluctuations in intensity of this low pressure, governs the rainfall. When the trough is well defined, and the low is well marked, rainfall over the southern peninsula is good. Most of the NEM rains depend on depressions and cyclones from the Bay towards the East Coast of India. This is more so in the coastal Districts.The highest seasonal rainfall (October-December)of around 75 cms occurs along the SE coast of Tamil Nadu and adjoining South AP. This brief note is not to be used for commercial purposes. Thanks you so much for the NEM Watch series...looking forward for more. Will share the same in Kea and my blog. @ Rajesh Sir. Thank you very much for the explanation on conjunction between 2 lows in the upper atmosphere..
2. & Demonstrates the pattern of the jet stream, showing how it is linked to and by the difference in warmer and cooler air masses..
nicely explained on NEM article..
Alysiall 46Thnx Rajesh. Should be a funda for all of us. Need to digest all the information. extremely heavy rains n thundering at nallasopara. The withdrawl of SWM this year should be delay. maharashtra will get rain upto 15-20 oct.withdrawl possible after 20 oct. From maharashtra. Yesterday Badlapur had light drizzle in between of the whole day. But mostly was dry day just 3mm noted till night 12am. But today early morning first heavy Rain spell fallen around 4am then from 5am huge thundering sound and lightening was seen with drizzles upto 7am. Now blue patches of sky seen with low level clouds from SW to NE direction. So overall Badlapur records 33mms rain in past 24hrs. (i.e from yesterday 8.30am to today 8.30am on 09-09-2012). By mistakenly mine previous comment got posted via Anonymous..
And Early Morning thunderstorm was noted by Mumbai also.. Some AWS rainfall data of past 6hrs.. Many documents talk about negative correlation between NEM and SWM. Past 5 years has seen late withdrawls of SWM (stuck over Maharashtra for long time - bringing more rains). This reduces duration for NEM with late onset, not good for TN (having many places with 0mm of rain). Previous years have also seen weak NEM over Kerala. Last year was unusual NEM traversed Indian Ocean and hit Saudi? Bangalore day 9 september NO RAIN. sset this year N.E.M ,it will travel to your door step so dont worry, bangaluru will have good rains .not saudi . very high chances of N.E.M, TO BE VERY WEAK THIS YEAR, LETS HOPE FOR THE BEST.SSET. No chances of widespread rain here in Ghaziabad today.Sky is very much clear with high humidity. conditions here are not looking favourable for good rainfall. But now i can see some heavy clouds in the eastern side,may bring some rain. Pavan: Good observation on the depressions and cyclones pre and post monsoon. also, if you go through last years vagaries blogs of october 2011. we have systems upto AS-4, prolonging the SWM last year. Vivek/Arprit: Seems BB6 has stopped its Northern advance.BB6 has merged with the Saurashtra low, and is over Kutch region now. Great work Rajesh sir ! Thane right now overcast with thich black clouds. But no meaningful rainfall as yet in the evening. Morning as reported by Abijit about 55 mm since 00 am. Neeraj: Kathmandu, it seems may end up a bit in the minus. With the new low in the bay, the axis may remain in central India, not giving the impetus to Nepal region. I feel, after this system, the monsoon will start its retreat. But, i see the system changing early to welcome Wd's. Good for Nepal then..! Medium spell of rain was on here in Badlapur from past 45mins. Now from last 10mins medium to heavy rains with huge thundering & lightening.. Same was noted in early morning 4am also. @ Rajesh Sir.I am experiencing such thunderstorms on daily basis and that too from west side for first time !! Otherwise thunderstorms means either NE/E/SE or sometimes north or south direction also ! But from west direction and from monsoonish clouds very rarely seen ! Means I want to say thunderstorm from low levels clouds which are traveling from west to east and no thunder heads visible before thunderstorm and normally monsoonish thick black clouds moving . abhijit: Perfect observations.You rarely get thunder from clouds coming in from west. In fact I have VERY RARELY Seen such in Mumbai in so many years. Now, in your case, there was a thunder head North of Badlapur, and i checked up its hieight at 12 kms. A single piece. That produces an inter cloud lightning. Could be that the lower western clouds covered up the thunder cloud. Sometimes a lightning is seen "peeping" out from the lower clouds. I have a picture of such an event. Putting it up for you on Mumbai Page now. @ Rajesh Sir. Thanks for guiding. Seen the lightening snaps posted by you even that much bolt was not visible here. As I was trying to observe the lightening bolt as huge thunder sounds was heard but as you said it was happening the same.. No direct Lightening bolt was seen as you said that low level westerly clouds were hiding thunder clouds and only huge flashes were brightening up the Badlapur..
Link (2010) clearly states about probability of Bangalore and surrounding areas towards desertification, noted scientists and environmentalists have stated this. Rains are no longer 1000mm, many times 300mm - 500mm, soil has become like desert soil. Infact now Kutch/Jaiselmar receives more rain than Bangalore/Mysore. High time KAR state government with support from weather scientists come to some conclusion before bomb ticks. abhijit: Thunder clouds over Matheran now..
@ Rajesh Sir. Yes Badlapur rains & lightening & thundering completely stopped now from past 15mins. And doppler radar image showing thunder clouds over Matheran. And Rajesh Sir Alibaug & surrounding 15kms area too showing heavy rains so are they too thundery ! Now steady drizzling from last half hour here . What is the forecast for Mumbai for the next 2-3 days? Why are we having these thunderstorms in Mumbai? Pankaj Chandra: Thanks. If you are new to vagaries, we welcome you. And where are you from ? anonymous:There are reports of thunder from badlapur and a report from Nalasopara. No report from Mumbai city, nor have i heard thunder here in South Mumbai.Seems that there was thundercloud development north of Matheran hills and over Matheran todat evening. Why ? I am unable to understand that, as it was an isolated cloud, not much spreadout too. Sorry, not putting up Mumbai forecast today, as it was a busy sunday for me..have to oblige social circle as well-:)) Can you clarify and put up your name..its odd chatting with an anonymous...always prefer to your the name.. I was driving from Shirdi today, started out around 4:30 PM, there was continuous rain - light / moderate after Sinnar, with more consistent rain as I left the ghats and was crossing Shahpur / Vashind. Did not see any Lighting till I was crossing Thane city (around 9:00 PM) - 1 / 2 odd flashes nothing much, also saw some lightning around Powai but no thunder nor were there any rains around Powai at that time. The weather around Shirdi / Kopargaon over the weekend was one of light rains and patchy clouding. It was breezy today afternoon. Could you please update mumbai lake levels update on monday. Looks like today gonna be typical monsoonal day. Thank you sir. This was excellent. Not sure if I understood everything yet. Any chance of more rain in the northwest this week? Yesterday Badlapur had occasional medium monsoonish spells in intervals for whole day then at 8pm saw thundery & lightening medium spell for 30mins then as usual monsoonish drizzles continued. From today morning 6am continuous rains are seen with very low level dark clouds coming from WSW. Now 9am, but by looking outside feeling like as if 7pm ! So overall Badlapur records 41mms rain in past 24hrs. (i.e from yesterday 8.30am to today 8.30am on 10-09-2012). One good news is Barvi Dam, Badlapur is now 100% full, yesterday on 09-09-2012.. So now Thane, Kalyan- Dombivli, Ulhasnagar, Ambernath & Badlapur cities administration will be relax till next monsoon season.. Very torrential rains in Badlapur mountain ranges of Matheran hills as if like cloud busrt in particular part of Mountain ! As all waterfalls from mountains are flowing with thick muddy waters and near by nallahs are having fresh red muddy water with full force and water flowing height too increased.. Some snaps of full force muddy water flowing & mountain fully covered with thick clouds posted on Vagaries FB. Overcast in Karachi at the moment. Jaccobad 305, Sukkur 164, Rohri 152, Khanpur 106, D.G.Khan 76, Larkana 58, Multan 52, Badin & Diplo 50, Chhor 35, R.Y.Khan 32, Barkhan 27, Jhang 26, Moenjodharo 25, Bahawalnagar 21, Bhakkar 20, Kakul 18, Parachinar & Chachro 17, Mithi & Noorpur Thal 16, Rawalakot & Garidupatta 15, Skardu, T.T singh & Joharabad 14, Murree & Sahiwal 13, Faisalabad & Muzaffarabad 12, Balakot 10 mm. Yes good rains in upper sindh. Are there still chances for a downpour in Karachi....as forecasted. I think so maybe in the afternoon as always happens in this scenario. It is now partly cloudy. Thanks Rajesh Sir for putting snap on blog. Now here dark low level clouds with mountains not visible but rain has stopped now. Same weather throughout on Badlapur - Karjat Railway/Road route. And yesterday at 8pm lightening strike confirmed in Ambernath East area from mine friend. No electricity in there area after lightening strike till now. Some short circuit in there area due to lightening strike. weather is absolutely fine here in ghaziabad with no chances of rain atleast for the next 3 hours. arpit ,as i had mentioned earlier rains will decrease towards delhi n ghaziabad . more sunny spells n less rains. jacobabad = 30 cms !! As per reports coming in: ‎Jacobabad (Sindh) received 441 mm Record Breaking Rain upto now...!! True to SSET statement : Lakes in Thar desert ! IMD is showing good rain for the entire next week in the northwestern india including delhi-NCR.Lets see what happens! on doppler radar there is a big mass if clouds northwest of mumbai coming towards it. its raining heavily at borivali west right now. rains have started in vasai, it is also very windy at the moment. Saurashtra & Kutch does it again!! Yesterday (ending 8.30am today) the subdivision received 25.3mm against normal of 3.4mm which is +644%. Punjab now trailing S&K with a deficit of 54% against 43% for the latter. CI in all received 89% above normal rainfall and SPIN 131% above normal. CI is now only 2% below seasonal normal rainfall and SPIN 5% below normal. rain stopped at borivali west. one of the news channel reported devala in nilgiries yesterday recieved 356mm (35cm) rain.they showed some flood related pcitures as well. But in IMD-chennai it mentioned as just 4cm. @GSB, the road from Ghoti to Sinnar is quite good baring a 2 KM stretch near the toll booth on that road, otherwise you can cruise along. Alteast readers are aware of Bangalore,Mysore... desertification process. IMD,ISRO,IIM,weather scientist should alert KAR government. Bangalore day 10 sep - very hot today. very soon rajasthan will be no more a desert area , but interior karnataka will become very soon the great indian desert, infact these places r more hotter in summer then rajasthan , also rainwise receive much heavier rain then karnataka.